340 people attended ENOG 1. In addition, we noted more 700 unique visitors (IPs) to the live webcast. This was the first time that an ENOG (Eurasia Network Operators) / RIPE NCC Regional Meeting was held. Attendance was free and open to all interested parties. ENOG is where network operators can meet their peers and learn from international and local Internet experts. Agenda topics covered challenges, tools, experiences and best practices in areas such as DNS, peering, routing, IPv6 and more. 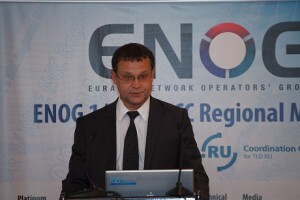 ENOG 1 was pleased to welcome the Minister of Telecommunications and Mass Media of the Russian Federation, I.O. Schegolev, to the meeting. The minister spoke during the Internet Governance session on Tuesday, 7 June. The archived presentations given during ENOG 1 are now online. The local Host of this meeting was Coordination Center for TLD RU.